Cytotoxic T lymphocytes (CTL) recognize peptides that are about 9 amino acids long. There are lots of constraints on which peptides can possibly be presented; the most important factor is whether the peptide can bind to one the MHC class I alleles that the host expresses. Still, a generic virus will have hundreds or more likely thousands of peptides that are reasonable CTL targets. Of those peptides, how many are actually recognized by CTL? Of those that are recognized by CTL, how many are recognized effectively (enough to trigger a detectable response)? Does it make any difference which, and how many, are recognized? And — most interestingly — why are so few peptides recognized? There are technical problems with this question. One huge problem is just how to identify the peptides that are recognized. Typically, you’d have to synthesize peptides from the viral genome, mix them with CTL from an immune host, and figure out which of the peptides activate the CTL. However, if you try to synthesize all the possible peptides from a viral genome, you’ll have many thousands of peptides: Expensive, to say nothing of the work involved in screening. People have tried to get around this in two ways. One is to use longer peptides. Traditionally, screening has used 15mers rather than 9mers. Using overlapping 15mers instead of every possible 9mer can cut your screening down into a relatively manageable range — a couple thousand or fewer. Still a big job, but practical. One problem with this, of course, is that 15mers shouldn’t work at all for MHC class I! MHC class I alleles (in contrast to MHC class II) rarely bind peptides anywhere near that long; rarely much more than 11 or so amino acids long. So what you’re counting on, with your 15mers, is that either they’re contaminated with incomplete synthesis products (a common situation), or that they’re partially degraded in the medium when you add them to your cells. In either case, you really don’t have a good idea what your actual coverage of the viral proteome is. Another approach is to try to cut down your required peptides, by trying to predict which ones could possibly bind to your MHC class I and only (or mainly) synthesizing those. The problem here is that for all the progress in understanding MHC class I binding motifs, there are lots of high-affinity peptides for various MHC class I alleles that don’t even come close to matching the putative binding motif. Your coverage is only as good as your predictions, and your predictions will miss some genuine epitopes. 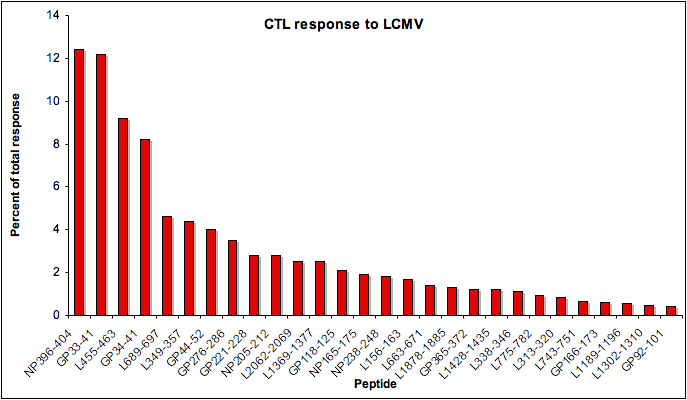 However, these 10 epitopes only account for around 80% of the CTL response to LCMV — that is, if you take all the CTL that light up in response to an authentic LCMV-infected cell, about a fifth of those will not light up in response to any of the known epitopes. What are those remaining guys reacting to? Kotturi et al went looking for the missing triggers. The 15-mer approach including truncated peptide sets required synthesis and testing of 1,2147 peptides and identified approximately 65.2% of the overall response. By contrast, the predictive approach required synthesis and testing of 400 peptides (or 160 if only the top 1.2%8 from each allele would have been synthesized) and identified approximately 88.9% of the total response. But the predictions did miss several true epitopes; some of the genuine MHC class I epitopes just don’t look like things that are supposed to bind to H-2Kb. If you want to pick up on things that are not, as yet, predictable, you still need a brute-force approach. The top 2 peptides of the 29 cover 25% of the response; the top 4, 50%. You need to put the bottom 18 peptides together to catch up to the first two and make up 25% of the response!10 This, ladies and gentlemen, is what we call immunodominance. The top handful of peptides are immunodominant — in a C57BL/6 mouse, those peptides will invariably be the targets of the vast majority of the CTL response.11 The other peptides will cause a response that, while detectable, is much lower than that to the dominant peptides. Well, we don’t know, but at least we think we know some of the possible explanations. More in a later post.